Elsevier, a world-leading provider of scientific, technical and medical information products and solutions, launched Materials Today Physics in April 2017. This new journal is the latest addition to Elsevier’s Materials Today family; a growing collection of branded titles, and an extended family of over 100 publications in materials sciences and related fields. 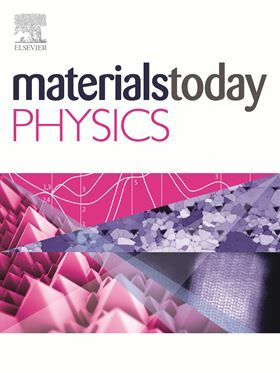 Materials Today Physics is a multi-disciplinary journal focused on all aspects of materials physics. Both theoretical and experimental work on synthesis and physics of novel materials and their applications are within the scope of the journal. “As a materials physicist, I have been facing the difficult choice over which good journal to publish interdisciplinary research findings in, since there is no specific journal for results that are neither pure materials science nor pure physics, but a mixture of materials synthesis, characterization, and physics. It seems the time is now ripe for a journal that can publish results in this quickly growing field.” said Editor-in-Chief Professor Zhifeng Ren from the Department of Physics and TcSUH at the University of Houston. “The goal of the journal is to provide a highly visible platform to materials physicists/chemists to publish their findings covering comprehensive aspects of materials science, physics, chemistry, and potential applications of the materials”. Dr. Liliana Birla, Publisher of Materials Today Physics at Elsevier commented, “With Materials Today Physics, a new high-impact journal in the Materials Today family, we aim to strengthen the connections between the materials and physics communities, providing a platform with very competitive publication time, strict peer-review process and robust links with the existing Materials Today family titles. The second issue of Materials Today Physics is published. To find out more information about the journal or to submit an article visit: www.journals.elsevier.com/materials-today-physics. For more information about the Materials Today family, visit www.materialstoday.com/about. Learn more about the newest addition to the Materials Today family.